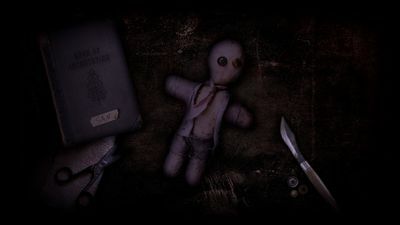 The Secret World: Legends puzzle trail, also known as "Kiss of the Revenant". The Kiss of the Revenant puzzle trail is a promotional series of puzzles linked to The Secret World: Legends. It was created by Alice & Smith, who also created the Waking Titan and Dawn Bloom ARGs. This Discord channel on the Game Detectives Discord. This thread on the Secret World forums. This page is a mirror of this page on the Cry Gaia Wiki. This page is a work in progress, and will be updated as new developments emerge. This page documents the Kiss of the Revenant puzzle trail. Be warned - there are puzzle spoilers on this page (behind spoiler tags)! The puzzle began when the official twitter for The Black Watchmen posted a link kissoftherevenant.com. It had already been hinted at during the Developer stream on 16 Jun. 2017, the day before the announcement, that there would be something coming up. 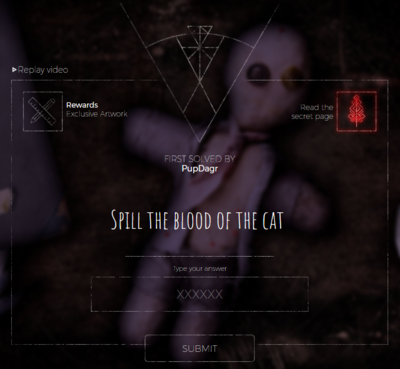 Following the URL redirects to mmorpg.com/puzzle.cfm where the puzzle is located. A screenshot of the puzzle's frame on mmorpg.com. It was quickly discovered that some letters were bigger than others, spelling out AHEOET. Examining the page's source code, every big letter's HTML tag also had a number. The numbers are 98 105 116 46 108 121, which is the ASCII decimal representation of bit.ly. Using AHEOET as a bit.ly link, people would end up at cdn.kissoftherevenant.com/shadow-bound-anim.gif. The gif found at the bit.ly link. This gif shows a shadow bound weapon, one of the possible rewards, in action. 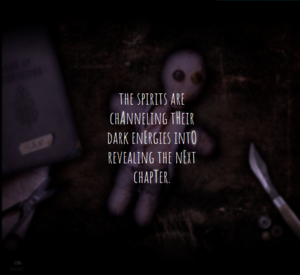 Furthermore, on the puzzle page a 'cursed soul' can randomly appear at a random position within the frame. When clicked, the text '+1 cursed soul' pops up, but outside of that nothing seemed to happen. 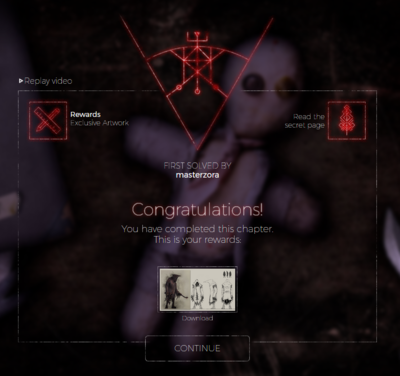 After the first chapter got unlocked, it became clear these unlock 'group rewards' when all chapters are completed (see the Rewards section down below). A soul appears at a random location. When clicked, the '+1 cursed soul' text appears. The secret page included with the first puzzle. At approximately 12:18GMT 2017-07-17 the first puzzle unlocked. 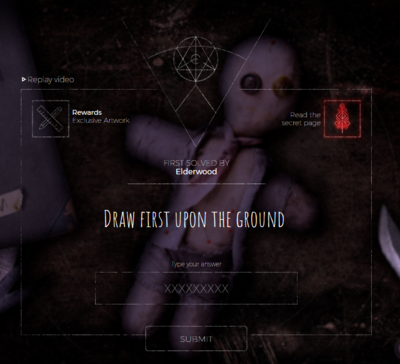 Clicking on the puzzle would play a short video, after which the hint 'Draw first upon the ground' is displayed. 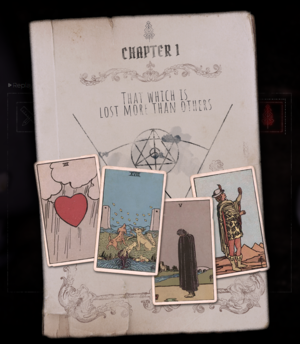 A secret page was given as well, containing four tarot cards with the hint 'That which is lost more than others'. Step closer. Let me see you. Mmmh. You'll do, you'll do. So then, let me tell you a story. Time was a family lived around here. Tragic. But someone like you? I'm sure you have heard it all before. Old man Henderson tried to walk away from power. Instead he lost everything... he ever built, everyone he ever loved. But this story isn't about him, but about his younger daughter, Samantha, and her struggle to be free of him. I see you found Sam's notebook. Maybe you can finish her work in binding the revenant. Hangs around here, y'know. Takes a lot of brains and a lot of guts. But the weapon you make sure'll be worth it. Come on, see if you can make heads or tails of it. The answer is what you would draw first upon the ground when binding a revenant. The tarot deck consists of the Major Arcana and the Minor arcana, which can be divided up in four suits. A trump card from the Major Arcana and cards of three of the four suits of the Minor Arcana are present, although they all have lost something. What has lost even more however is the fourth suit of the Major Arcana, the Suit of Coins, which has no card present at all. The Suit of Coins also known as the Suit of Pentacles. A pentacle is what you would draw, and entering pentacles as the answer completes the first puzzle. The solution was posted on reddit. The secret page included with the second puzzle. Maybe you're enough like Sam to get the job done. Took after her old man like they were peas in a pod. That is why they never got along. Her pap tried to hide his past from the whole family. But Samantha was well aware of all his secrets. She never got to Innsmouth herself. Shame. Given she had a talent for power. When she learned a little from watching her paps, and a little more while rifling through his papers while he was out. Y'know, what they say. A little knowledge is a dangerous thing, friend. The first part is the same as the email. Innsmouth refers to Innsmouth Academy most likely. After the video a hint is displayed again, this time being 'Dried and held under the tongue'. 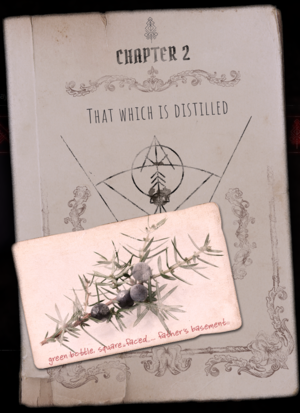 Another secret page was given as well, this time containing the hint 'That which is distilled', together with an image annotated with the text 'green bottle, square faced... father's basement'. 'That which is distilled' refers to the ingredient of something distilled. The ingredient is displayed in the image as well. The image depicts a type of berry. The berry pictured is a Juniper berry, used to make gin. The secret page included with the third puzzle. I see you're making progress on Sam's little project. She was trying to make her tools control her paps creations. When she was a pure heart and uncorrupted by the darkness around her. She didn't want power for its own sake, no. She wasn't fighting for the world or against it. She just wanted something to protect herself so she could escape with her sweetheart and escape from old man Henderson once and for all. *female laugh* And freedom is sweeter. Keep going, and see how you do. The hint this time was 'Place replica at the center of the pentacle for the new moon'. 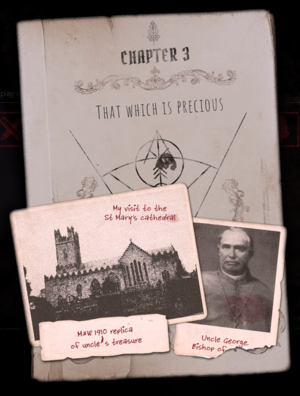 The secret page contains additional clues, stating 'That which is precious' as well as two pictures: one labeled 'My visit to the St Mary's Cathedral' and 'Uncle George, Bishop of...'. A piece of text saying 'M&W 1910 replica of uncle's treasure'. The Cathedral is located in Ireland. Try to find out who the Bishop pictured is. You got the Cathedral and his first name to help. Try to find out what happened during that Bishop's time as Bishop in the Cathedral. The secret page included with the fourth puzzle. and nothing you do here can change that. There is one moment of true happiness for Sam and her true love. Stealing kisses along the pumpkins. They say that Jack the Lad had sweet talked Samantha. But it went the other way around. She had a plan and Jack was part of it. That midnight embrace was an invocation that depowered her weapon. And it almost worked. Almost. ... Let's see if you could take that a little further. The hint this time was 'Spill the blood of the cat'. 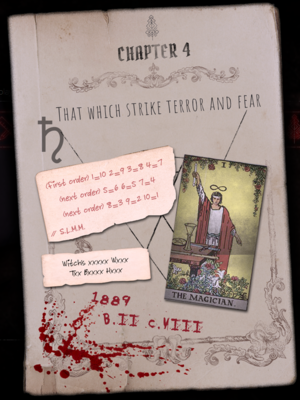 The secret page contains additional clues, stating 'That which strike terror and fear'. What would a witch use to spill the blood of a cat? It is a special type of dagger used for ceremonies. "OF THE KNIFES, SWORD, QUILL KNIFE, IRON PEN, SHORT LANCE, WAND, [STAFF,] AND OTHER INSTRUMENTS OF MAGICAL ART"
To add to this: the symbol in the top left corner of the page is Saturn's Sickle. A ceremonial dagger used by witches are also called an athame. The clues from the secret page, especially the obscured sentence, also point towards this. The secret page included with the fifth puzzle. And here we take our sharp turn into tragedy. but their moment of sweetness was cut short. Nobody can say for sure if Old Man Henderson found them together or if his scarecrows did. But I'm sure that Sam didn't get to end her invocation. She lost her life to her father's scarecrows instead. You might think this means that she failed. But you are wrong. She didn't fail at all. She was successful, beyond her wildest dreams. You are almost there. You can't stop now. The hint this time was 'Fix your gaze on high'. 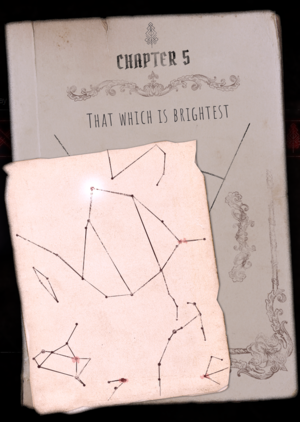 The secret page contains an additional clue: 'That which is brightest' along with an image. Going off the image, the word 'brightest' and 'gaze on high', it is easy to see that the clues are talking about a bright star. The map is a map of constellations. Some constellations are easy to recognize: Scutum on the left side, Scorpius on the bottom right side. The big one in the center has a star marked in white however. The constellation in the center is Ophiuchus, whose brightest star is Rasalhague. 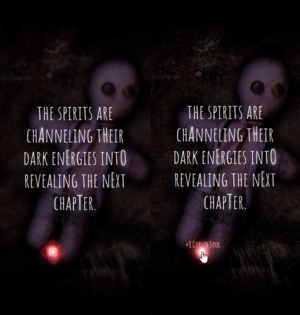 Immediately after completing the Fifth Chapter, it became possible to do the ritual. One weapon had to be selected for the ritual, and then the correct sequence of runes had to be selected. Five dots would light up in Mastermind style: red to indicate on of the selected runes is on the correct position, followed by grey dots for every correct rune in the wrong position. Every guess would take up some energy, and once the energy bar got empty there would be a short cooldown before it filled up again. There was a choice out of six runes for five positions, so at least one rune wasn't used. By trying to fill up all positions with one rune, for every run, it was easy to guess which rune(s) didn't get used, and how often the other runes should be used. After that it is simply a matter of guessing a rune in the first position and filling the rest up with an unused rune until the first rune is guessed correctly (indicated by a single red dot lighting up). The same process can be repeated for all the other positions until the correct sequence is found. 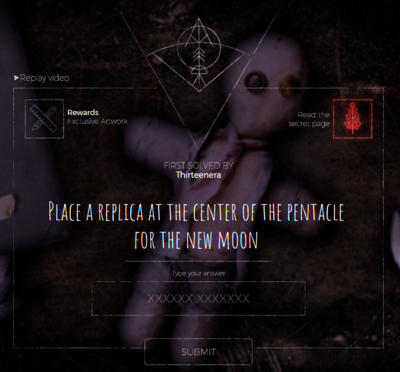 Once the ritual completed, players could leave their e-mail to receive the code, which would be send during the waxing crescent. The moon started its waxing crescent on 2017-06-24 and it will end on 2017-07-01. Well, I'll be damned. You did it. You captured the monster and lay poor Samantha Henderson to rest at last. Be careful with that thing though. The revenant is always in there, waiting. He'll come and fight with you. And for you from time to time. But it is always going to be in there. So if you are not careful... well you know what revenants do. Watch your back, friend. Or else someone might have to fend this your story too. A 'Shadow Bound Weapon' which has a 20% chance to summon a revenant with every hit. The revenant will cast raven blade which deals physical damage. The preview video is the same as the gif found at the start, except with a higher quality. Weapon/talisman distillates. This reward got changed from 3 200xp distillates of each type to one 600xp distillate of each type during the puzzle. Only the weapons were unlocked when the rewards screen came available. 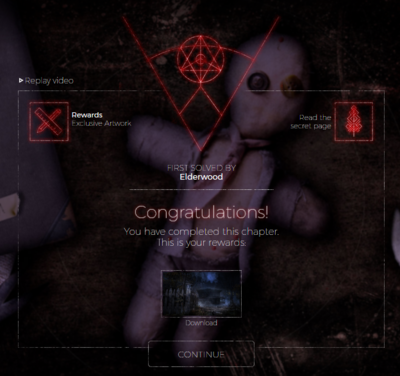 The rest of the rewards had to be unlocked by collecting souls. The second reward was unlocked at 19:27GMT 2017-06-17, when 2500 souls were reached. The third reward was unlocked at 17:16GMT 2017-06-18, when 5000 souls were reached. The fourth reward was unlocked at 21:04GMT 2017-06-19, when 7500 souls were reached. The last reward was finally unlocked at 03:47GMT 2017-06-25, when 15000 souls were reached. Around 13:17GMT 2017-06-19 people started reporting that the souls had reset to 2500. Anashel confirmed this was a bug in the Discord channel at 13:24GMT, and the issue was resolved a few minutes later. A piece of artwork is also given as reward for completing each puzzle. The full background, only the center is visible in the frame. An image showing various icons used. Note that the chapter numbering isn't correct. The rewards page as of 08:39GMT 2017-06-18. The rewards page as of 20:41GMT 2017-06-18. The rewards page as of 20:36GMT 2017-06-20. Notice the updated second reward. The rewards page as of 16:19GMT 2017-06-26, with all rewards unlocked. The first puzzle is unlocked. The reward of the first puzzle. The image shows The Black House in the Savage Coast, and is also a loading screen in TSW. According to the file's metadata, this image was created 2012-05-01. The 'home' screen after the first puzzle is complete. 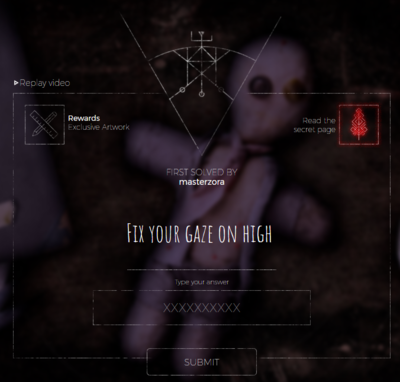 The screen shown when clicking on the second puzzle while it was locked. 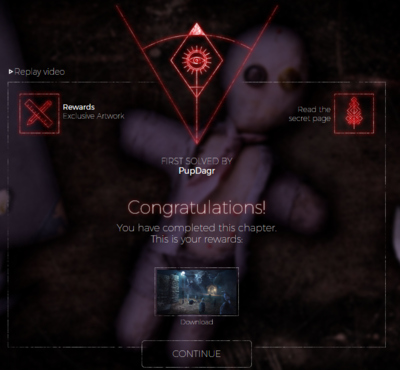 The reward of the second puzzle. The image shows the graveyard used in the first part of the new tutorial. The 'home' screen after the second puzzle is complete. 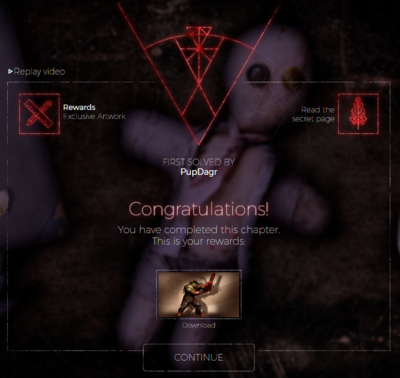 The reward of the third puzzle. It is a concept art of Jack dating back to 2008 (4 years before TSW launched). The 'home' screen after the third puzzle is complete. 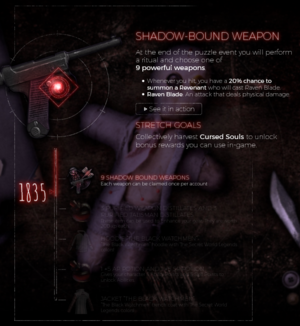 The reward of the fourth puzzle, showing some concept art of a revenant. The 'home' screen after the fourth puzzle is complete. The reward of the fifth puzzle, showing a design document for the revenant. The 'home' screen after the fifth puzzle is complete. The 'home' screen after the ritual is complete.